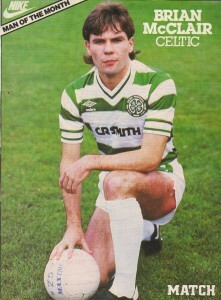 In January 1983 Brian McClair was a Motherwell player when he exploded on to the Scottish football scene. On January 3rd he smashed in a hat trick against Rangers in Well’s 3-0 win and 12 days later he scored twice against Celtic when Motherwell put Celtic to the sword by two goals to one. 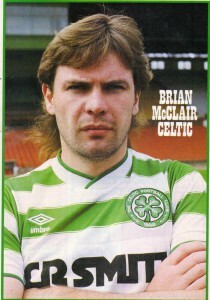 McClair’s winning goal was courtesy of a terrible last minute blunder by Celtic ‘keeper Pat Bonner and thus began a poor run of form which ultimately cost Celtic the league title by the narrowest of margins to Dundee United in May 1983. 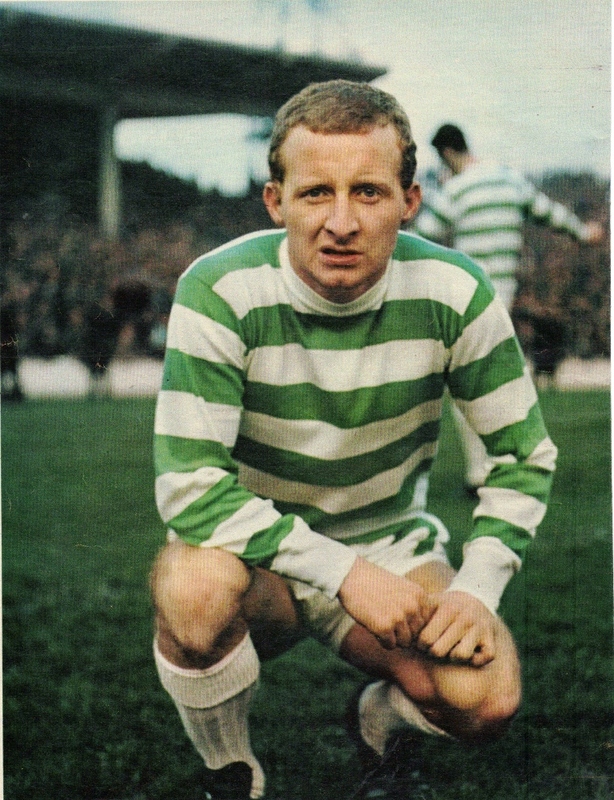 Upon signing for Celtic in the summer of that year, Brian was asked if he regretted scoring those goals to which he replied that he wasn’t, as he wanted to show Celtic that he was good enough to play for them and thus his plan had worked despite his part in Celtic’s title failure. Billy McNeill signed Brian as a replacement for the departing strikers Charlie Nicholas and George McCluskey but he himself was to depart to Manchester City a matter of days later. 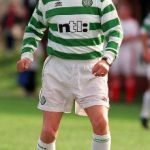 Davie Hay inherited Brian’s talents and despite signing high profile strikers in the coming years such as Jim Melrose, Alan McInally, Mo Johnston and Mark McGhee, Brian was to finish as Celtic’s top scorer in all of his four seasons at Parkhead. He made an inauspicious start to his Celtic career but came to the fore at Dens Park in September 1983 when he fired in four goals in Celtic’s 6-2 on his full debut. Astonishingly, Hay dropped him for a UEFA cup game in Aarhus four days later, preferring the more experienced but less talented Melrose. However Brian’s eye for goal ensured that he was to be a regular starter from then onwards. When Mo Johnston arrived in 1984 Brian was able to adapt to playing as an attacking midfielder with great success to accommodate both Johnston and McGarvey in the striking roles. 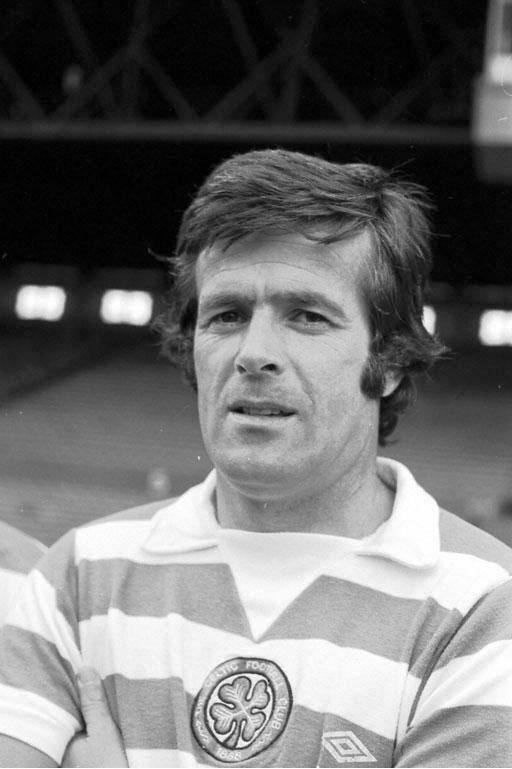 In November of that year he fired in a perfect hat trick at Tynecastle from a central midfield position in an excellent 5-1 win and it seemed that every time Celtic put a cross into the box that day that Brian either volleyed or headed it home. On New Years day 1985 Celtic were in deep trouble at Ibrox at half time, lucky to be only 1-0 down. In the next 45 minutes they blew Rangers away and won more convincingly than the 2-1 score suggests and the winning goal was typical McClair with him timing his run perfectly from midfield to score from a cross ball. He had an excellent record against Rangers and also scored on New Years day 1986, a cracker of a header from a superb Paul McStay run and cross, on the day when the Jungle taunted Ally McCoist mercilessly for his missed chances (Ally for Scotland ! Ally for Scotland !) although it’s fair to say that ‘Super Sally’ gained a fair modicum of revenge in the following 12 years. He had a cool head in front of goal and was an excellent finisher. It’s my own viewpoint that, with the exception of the incomparable Henrik Larsson, McClair was the most natural goalscorer I have ever witnessed in the hoops. 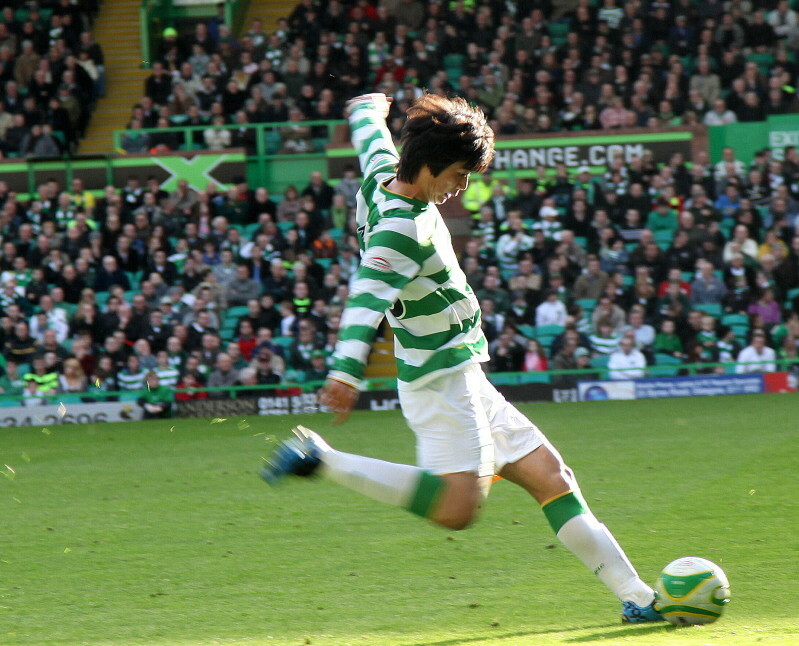 For a small man (at 5 foot 9 inches) his timing in the air was exceptional, he could score easily with either foot and like all good strikers he had a powerful shot when required. However he was not perfect and on the debit side his control often left a lot to be desired and his crossing could be wayward but there was no one better at timing his runs in the area and finishing inside the box. He had a totally natural talent of scoring goals. 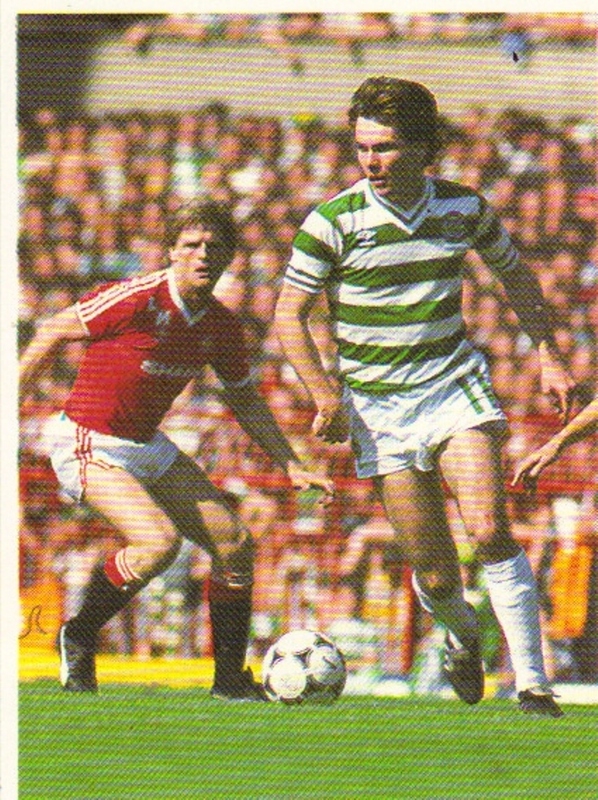 McClair formed a fruitful but rather strange striking partnership with Mo Johnston. 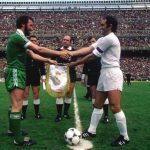 Although their scoring records were most impressive it was clear that both men disliked each other and there was clearly no warmth between them in the way Celtic partnerships had previously enjoyed, such as Dalglish/Deans and McGarvey/Nicholas. Johnston, with his dyed blonde hair, flash car, white tracksuit clothing and partying life style was in stark contrast to McClair, the married family man who liked nothing better than staying home listening to his huge record collection. On the terraces you could almost sense their dislike of each other. 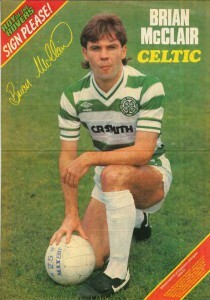 Brian was responsible for some of the most spectacular Celtic goals of the 1980’s. Think of the goal he scored at Parkhead against Sporting Lisbon in 1983 when he ran from distance onto a Tommy Burns’ pass to score; the fantastic first time half volley at Hampden from 25 yards against Rangers in 1986 which flew in the top corner; the brilliant individual run and finish against Dundee United at Parkhead in August 1984 after he had ran 60 yards with the ball from his own half; the sliding execution from a perfect Davie Provan cross in the ill fated match against Rapid Vienna in 1984. In the spring of 1987 both McClair and Mo Johnston’s contracts were up for renewal which was not exactly great planning from the Celtic management. 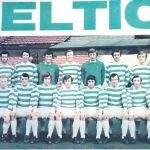 Celtic poured most of their effort and resources into trying to appease Johnston much to the frustration of many of us who regarded McClair as the focal point of the Celtic attack. Davie Hay was sensationally sacked in late May and Brian had enjoyed a close personal relationship with Hay which went back to their Motherwell days. It’s felt that these were the main reasons for his ultimate departure. Despite Billy McNeill returning as Celtic manager Brian opted to leave for Alex Ferguson’s new Manchester United set up. Freedom of contract had now kicked in and the transfer fee was to be decided by a cross border tribunal with Celtic looking for his market value of £2M and United offering a ‘derisory’ £600,000. 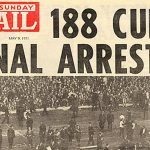 The eventual fee was decided as £850,000 with Celtic feeling rather swindled by the outcome. It’s my opinion that only three Celtic players have ever left the club to truly better themselves in a footballing sense. One is McClair and the other two are Henrik Larsson and Kenny Dalglish. 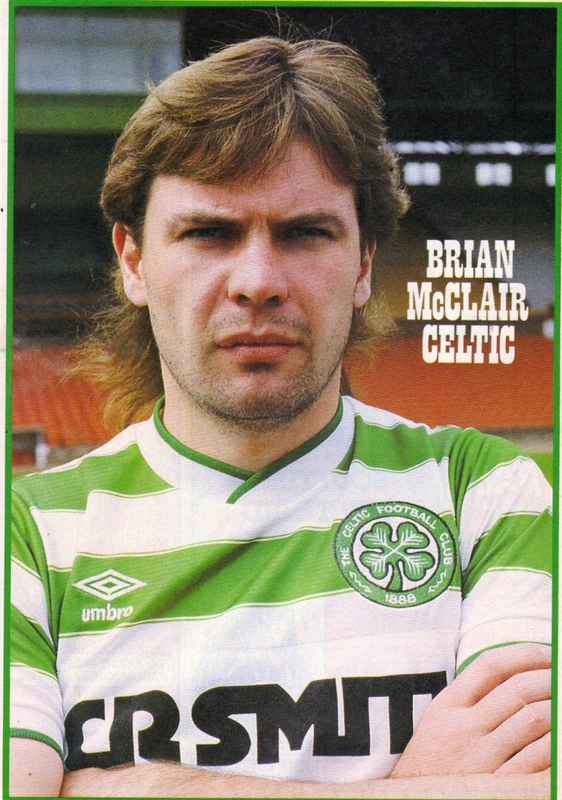 Had he chosen to decline the overtures from Old Trafford as Jock Stein and Larsson have done in differing eras then there is no doubt that Brian McClair would have gone on to become an absolute Celtic legend. Team supported as a boy ? – The Lichenstein national side. What would you do if someone gave you £50,000 ? – Buy 4,000 compact discs. What would you do if you were invisible for a day ? – Raid the nearest record shop. If you could be a fly on the wall where would you most like to be ? Inside 10 Downing Street during a cabinet meeting. Do you have any recurring dreams ? Yes, being shot. 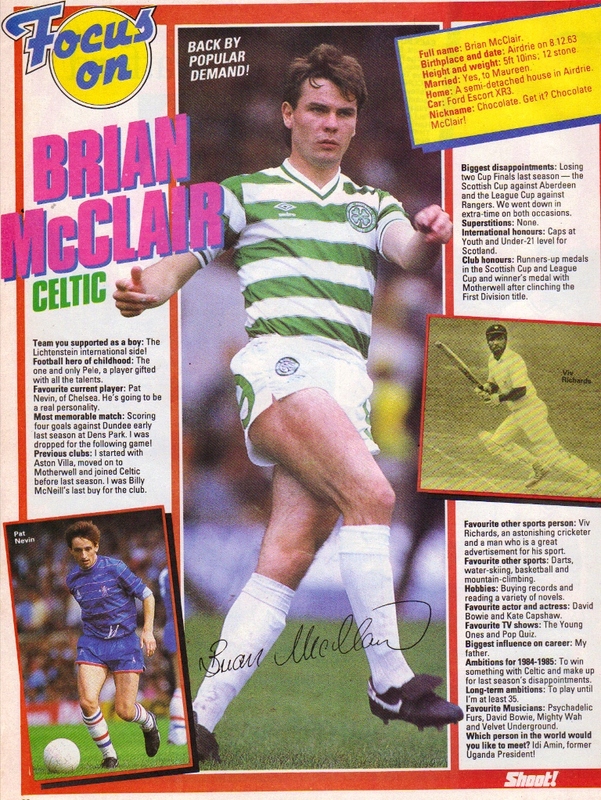 Brian McClair could certainly never be described as conformist.